Experience Britain's second city, a thriving cosmopolitan centre, with some of the finest shopping, culture and visitor attractions in Europe, with it's waterside pubs and colourful boating community. Travel through Birmingham's past industry of glass making, and old engine houses which uses to pump the water from flooded colliery mines. By the 20th century Birmingham had become the metropolitan hub of the United Kingdom's manufacturing and automotive industries, having earned itself a reputation first as a city of canals, then of cars, and most recently as a major European convention and shopping destination. If time allows take a train ride on the Steam Railway. The Severn Valley railway is a full-size standard-gauge railway line running regular steam-hauled passenger trains for the benefit of visitors and enthusiasts alike between Kidderminster in Worcestershire and bridgnorth in Shropshire, a distance of 16 miles. The canal basins at Stourport are full of pretty moored boats, the locks are open 24 hrs, and form a staircase, the lock-keeper is around much of the day in case of difficulties. 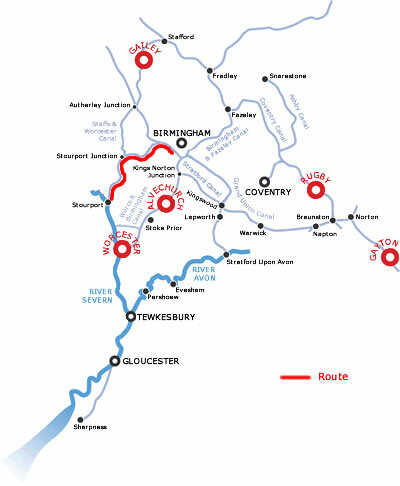 You should proceed to the eastern corner of the upper basins to join the Staffs & Worcs canal. There is a useful tea room & craft shop by the lock and temporary moorings. Beyond Falling sands Bridge look out for the steam trains on the Viaduct on the Severn valley Railway. There are good moorings at Weavers wharf between bridges 15 and 16 , with supermarkets & cafes nearby. Wolverley is north west of bridge 20 and is a fascinating village once dedicated to the nail-making industry. The church stands on a sandstone rock so steep that the building has to be approached by a zig-zag path cut through the constantly eroding stone. In the base of this outcrop is the remains of a smithy's shop. Many of the houses nearby are partly carved from the rock, their dark back rooms actually caves. The canal continues through secluded woodland and pretty locks to the very pretty village of Kinver, where you can stock up on provisions or get some fish & chips! It is worth having a look at the fascinating Rock houses, carved out of the cliffs and in continuous occupation for 150 years until 1935. (Walk up Stone lane close to the White Hart Hotel until trees appear on your left, then follow the path into the trees, the rock houses are at Holy Austin Rock). Stewponey Wharf at the head of Stewponey lock is very interesting wharf with a restored octagonal toll office. Turn right at the Stourbridge Canal and you immediately encounter 4 locks . The Stourbridge and Dudley Canals link Birmingham to the River Severn and you pass through a mixture of fine countryside old industrial surroundings and new developments. You pass pretty wooded countryside which surrounds the canal until 2 miles later you pass the Stourbridge Town arm to your right which you can ignore, keep straight on through the flight of 16 Stourbridge Locks which raise the canal 145 feet. Beyond lock 13 the canal passes Redhouse Glassworks which houses Stuart Crystal . Moorings are provided for those who are visiting the Museum in a restored bottle kiln. You can moor by lock 5 as there is a fine old canal pub here called the Samson & Lion where boatmans horses were once stabled where you can get a burger and pint! Ignore the Fens branch and take the right turn through Brierley Hill and Dudley. There is a handy Fish & chip shop and takeaway next to Farmers Bridge. 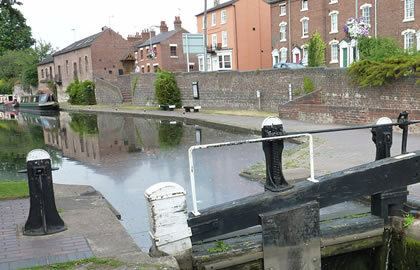 A more open landscape flanks the canal now and the start of the Delph locks is in view and here the Stourbridge canal ends and the Dudley canal starts.The flight has been designated a conservation area . Leaving the flight you pass the vast Merryhill shopping centre in Dudley with its 250 shops, and modern waterfront area with many restaurants and bars, so if you would like to stop for a bit of retail therapy or a meal in one of the lovely Restaurants now is your chance. The Blowers Green Lock is the deepest on the Birmingham Canal navigation, and the pumphouse here has been restored. There are good views towards Netherton hill, at the top of the hill is St Andrews Church where cholera victims were buried in mass graves. After the lock a sharp right turn is required as straight on the Dudley Tunnel which is impassible for boats with engines. Netherton was once the centre for chains and anchors but the old wharves no longer house these activiites. Beyond Fox & Goose Bridge the houses retreat and a fine green open space by a lake lies beside the Windmill End Junction , with cast iron bridges and the remains of an Engine house with its tall chimney still standing, built to pump water from the local mines to keep them from flooding. The Bumblehole Branch is off to the west, but you will continue straight on to the grand entrance of the Netherton tunnel , the canal is high on an embankment in a nature reserve. Netherton Tunnel has a long history of haunting. At least 2 ghosts have been reported here. The first is an old time policeman who was saidto have been mudered in the tunnel and the 2nd is a lady in a dirty white dress known as the Grey lady. People have also heard footsteps behind them which stop when they turn around, and also wet footsteps disappearing into the tunnel but which suddenly disappear! Netherton tunnel is 3027 yards long and emerges to go under the Tididale aqueduct which carries the Wolverhampton level, and at Dudley Port Junction you turn right along the Birmingham Level main line. At Bromford Junction do not turn off but keep straight on under the Stewart Aqueduct which takes the Wolverhampton level overhead, through Galton Tunnel (122 yards), ignorng the Soho Loop and Icknield Port Loop and you can moor by Sheepcote Street moorings or further on at Gas Street Basin. You are in the heart of Birmingham's canal network, which has been redeveloped into a unique experience where traditional narrow boats moor up next to cosmopolitan cafes and bars. The surrounding area is a vibrant arts & entertainment area and there are many shopping options within a short walk. It is a designated conservation area, with only 200 listed buildings, and has been described by English Heritage as 'a unique historic environment in England'. It is 9 hours to here .